Pretty Splitty | First Blog! Can I say I’m a blogger now? First Blog! Can I say I’m a blogger now? Eee my first blog, this is so much fun. Being a creative person I don’t find it very easy to keep track of my thoughts and being such a visual learner I get distracted very easily by what I see in front of me. Hopefully this blogging malarkey will help channel my thoughts into a positive direction and equal productivity. The main theme on my mind over the last couple of days has been ‘thankfulness’. I find it very easy to zone in on the one area of my life that I am maybe finding difficult or needs improvement. Of course it is important to be aware of such an area in your life in order to overcome it, but what about the multitude of blessings in our lives that will bring me so much more joy to focus on? When I was studying Fine Art at Loughborough University some years ago, the concept that all my artwork was generated from was appreciating the mundane. Seeing something beautiful in the everyday. I took everyday objects, such as household appliances and made music videos from them. They were quite uplifting humorous pieces but the underlying theme was and continues to be so powerful. It’s not easy to force yourself to stop and take stock of what is around you, what you can see, what you can hear and to simply look for the beauty in them. But something magical happens when you do. Your perspective changes, your mood improves and thoughts slow down and become more manageable. Most days I go for a short walk around the block to get my daughter to sleep in her pushchair for her nap. I know when she is asleep I can get a couple hours of work done. It is a means to an end. But a few days ago I decided to enjoy the walk and take note of what I was seeing. 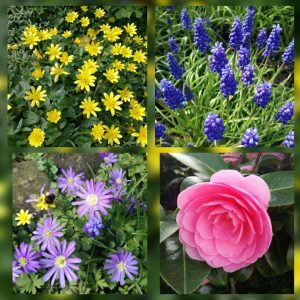 I spotted these lovely Spring flowers in people’s front gardens and took a few snaps of them. It reminded me that Spring is here and I absolutely love Spring for all the newness it brings. Perspective changed, mood lifted and thoughts brightened and detangled ready for the next stage in my day. So here’s my challenge to you, list ten things you are thankful for, I guarantee you’ll feel pretty darn great when you’re done and hey, if ten is too easy, go for twenty.